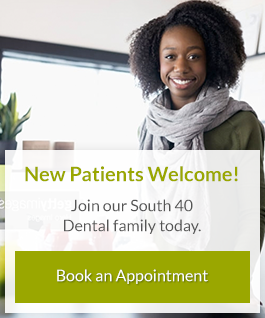 You can trust the staff at South 40 Dental, Grande Prairie to help restore the health of your smile with professional crowns and bridges. If you have a tooth that is decayed, weakened or cracked, has an older or failing filling, or has had a root canal performed on it, a dental crown (sometimes referred to as a ‘cap’) may be required to ensure that the tooth doesn’t have additional trauma/breakage. In cases like this, a filling or bonding will not be sufficient to restore the tooth. Usually, a tooth requiring a crown requires 2 appointment times. The first appointment is to prepare the tooth by removing the old filling, or decay, and reshaping the tooth to accommodate the new crown that will be placed on top. An impression is taken of the prepared tooth, a temporary crown is fabricated, and the impression is sent off to a lab for the permanent crown to be made. Once the lab has fabricated your permanent crown, you will need another appointment time to have the temporary crown removed, and the permanent one placed. At South 40 Dental, we offer CEREC® same-day crowns! The benefits of same-day crowns are, it is cost effective and saves time restoring damaged teeth. The entire procedure can be up to two hours. Dental bridges are a great way to replace missing teeth. Your existing teeth are used to literally create a bridge to cross the area where your tooth is missing. Bridges are made of gold, metal, alloys, or porcelain to ensure that they are strong and durable. The process of creating a bridge begins by creating abutments out of your existing teeth where the bridge will be attached. The existing teeth are re-contoured to provide a base for the bridge. After the abutments have been created, a mould is taken of the area which is sent to a dental lab. The lab uses the mould to create the bridge. The bridge consists of two crowns on either end, to place on the abutments and a pontic, which is the new tooth. We will fit you with a temporary bridge while we wait for the lab to craft your permanent bridge. When the permanent bridge has been created, you will have another appointment during which we will set the bridge. If you are missing a tooth you should strongly consider having it replaced. Besides the aesthetic disadvantage of missing a tooth, it could also cause structural changes in your mouth and jaw. It can become difficult to eat or speak properly. Set up an appointment today to restore your smile. Before you receive your permanent crown or bridge you will first receive a temporary restoration. This is not as sturdy as the permanent version, so you should be careful when cleaning and eating. You should brush the area gently and should not pull up on the tooth when flossing because it could become dislodged. The same goes for eating. You should avoid sticky or chewy foods while you have the temporary in. There may be some sensitivity and irritation after the temporary or permanent is placed. This is normal and will subside after the soft tissue heals. Take care of your bridge or crown by brushing and flossing regularly.